If you’ve been reading the site for a while, you know that I love Wadjet Eye Games (The Shivah, the Blackwell series, Gemini Rue, Resonance, and Primordia, among others). This time, the game wasn’t developed by them, but published, like Primordia. 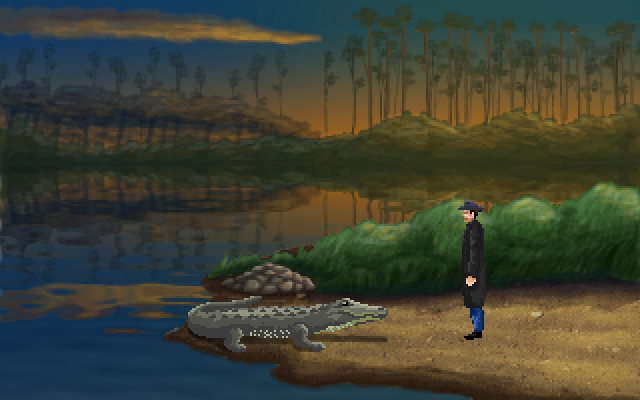 A Golden Wake was developed by Grundislav Games (the totally free Ben Jordan: Paranormal Investigator). This is like no adventure game I’ve played so far, in that the story is a straight drama. There is no hint of the fantastical, or a grand adventure. You are Alfie, a regular Joe, and the game spans about a decade of your life. I absolutely loved it. The characters are well-written and fun, and Alfie in particular is a complex man who you might not always root for. Additionally, most of the main characters around Alfie are based on real-life people, which is a really cool thing. The plot takes a number of twists and turns while still staying believable, and it really pulls you through and makes it difficult to stop playing. This is one of the most gorgeous adventure games I’ve seen in a while. The world is colorful and detailed, landing somewhere between pixel art and painting. Every environment is visually distinct, with the Everglades and Cuba being my favorites. The portraits are detailed too, with Alfie’s getting the most attention. Everyone’s personalities are captured well. There’s a cool sequence at the end that shows you the character’s portrait and then a picture of their real-life counterpart. The soundtrack is mostly brassy, upbeat jazz, with some strings sneaking in later, and it fits the time period perfectly. The voice actors are all excellent as well, with some Wadjet Eye regulars as well as new voices. Everyone sounds crisp, clear, and well-cast. 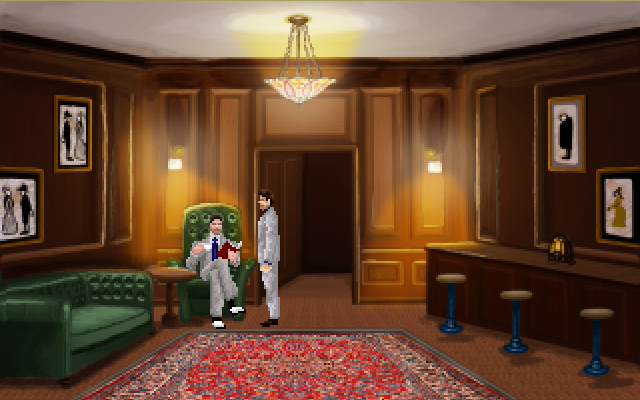 Beyond the standard point-and-click play, A Golden Wake offers a few diversions. The biggest of this is the persuasion mechanic, where you navigate through a dialogue puzzle with a person in order to convince them of something. There’s also a logic puzzle, a hidden object game, and a couple chase scenes. The puzzles are quite logical and straightforward for the most part, and I was never left feeling like I didn’t know what to do next. 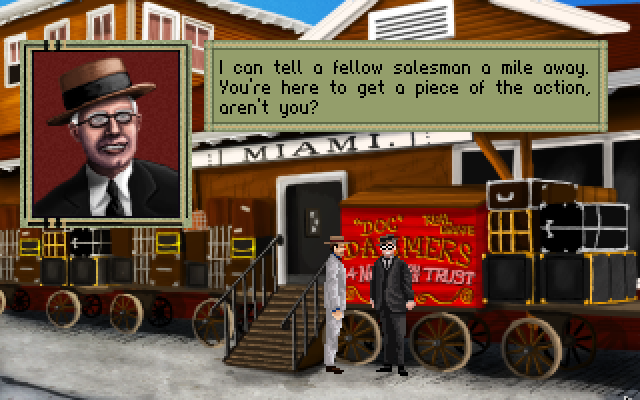 There are a few homages to other adventure games, but nothing overt that breaks the fourth wall, which felt right to me in a (mostly) serious period piece. There are definitely times the game made me chuckle, but the overall tone isn’t comedic. Finishing the game took me five hours, according to Steam. There are 18 achievements, and I ended up with 7 after my first run-through. There’s also a commentary to listen to after you finish the game, as has become standard with Wadjet Eye games. They’re always informative and entertaining, so I encourage you to check it out. 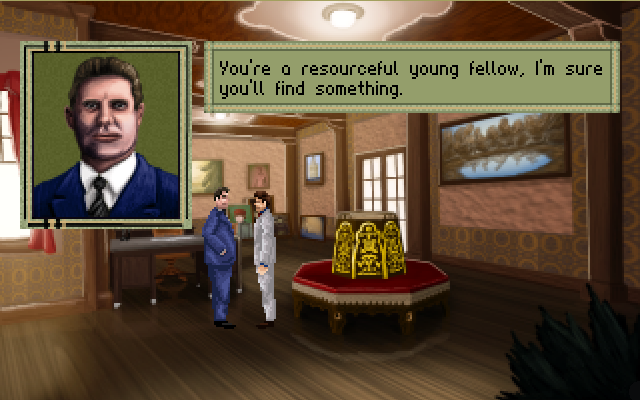 Another fantastic game from Wadjet Eye; I expected nothing less. Absolutely for fans of the genre who want to see something a different, but great for adventure newcomers too. This is a game I can see myself replaying often for the excellent story and logical puzzles. You can get A Golden Wake on the official site, GOG, and Steam for $14.99. Visit the Wadjet Eye official site, Facebook, Twitter, and YouTube along with the Grundislav Games official site, Facebook, and Twitter.